I know that those inclined to serious literature might scoff at this post, but the truth is that nothing makes me happier than reading a good mystery. Sure, I might not do that all the time given the other material that I have to read from time to time, but whenever I want to give my brain an easy ride, that is where I go to. This passion started over a decade ago when I picked up my first collection of Sherlock Holmes short stories at Ao Livro Tecnico bookstore in Fortaleza, Brazil. I was browsing through the shelves with my then-girlfriend back then as she looked for English-language copies of classic novels. I cannot remember exactly what she was after (I think it was D.H. Lawrence, but I cannot say for sure), and I was sort of going through the shelves when I saw this partial collection of Arthur Conan Doyle’s immortal amateur detective. From then on there was no turning back – I read every single story ever published, and from there I moved on to Agatha Christie, Jeffery Deaver, Sue Grafton and countless others. I also read many ‘parodies’ of Sherlock Holmes novels written by other authors. I don’t read these books all the time, of course. I do have a passion for different literary genres, including biographies, historical novels, political books, Latin American literature and many others – but I do find comfort in picking up a good mystery when my brain gets tired of all that seriousness around. They feel like some delicious food that might not exactly be too nutrient or energetic – but heck, is it delicious and satisfying. 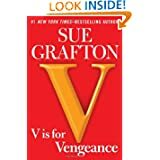 This week I began reading Sue Grafton’s “V is For Vengeance,” the latest installment of the Kinsey Millhone Alphabet series that began with “A is for Alibi” and continues to this day. I came across Grafton about a decade ago, when “P is for Peril” came out. I was hooked, and have followed the series since – and even picked up a handful of the previous installment. I enjoy Grafton’s sense of humor and of course her character, a private eye with a cynical point of view towards people- a trait probably caused by her divorce before the series began.